I don't recall how I found out about Lula's Sweet Apothecary, but I am definitely glad I did. A self-described "Formulator & Dispenser of Frozen Confections," Lula's is neatly tucked into a small space in New York's East Village. Despite its size it overflows with character (and gluten free treats!). The shop primarily serves up vegan ice cream. Normally such ice cream is overflowing with soy, but not in Lula's Sweet Apothecary. Instead of soy, the shop uses cashew and coconut bases to create delicious ice cream. Biting into the mint chocolate chip, I could barely believe that the ice cream was dairy and gluten free. Perhaps the best part of Lula's for us gluten free folk is that they mark the ever-changing flavors with easy-to-read "gluten free" asterisks. While the shop's online menu doesn't list online flavors, the person working at Lula's when I visited assured me that they always have gluten free flavors available. On the day I visited there was only one flavor that wasn't gluten free. They also have gluten free cones available! 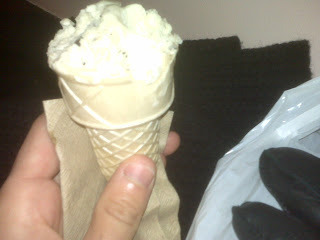 I can't remember the last time I went to an ice cream shop and was able to order a cone -- it was a magnificent feeling. I'd also be remiss if I didn't mention the wonderfully attentive service I received. The person working Lula's when I visited was extremely helpful and offered me endless samples as I made the difficult decision of which flavor to ultimately eat. He was also helpful in explaining the process by which they make the ice cream and guiding me through the gluten free options available. I braved the freezing cold temperatures outside to enjoy a cone in the dead of New York's winter. Despite the horrendously low temps, Lula's was still a great experience; I can imagine that it is even better on a hot summer day in the city. Lula's has definitely made it onto my list of New York musts.